Features Include: Rumble seat, dual side mounts and leather interior. LaSalles were built by General Motors Cadillac Division and named after the French adventurer, Rene Robert Cavelier LaSalle, who explored the Mississippi River Valley in 1682. Alfred P. Slope, JR, Chairman of General Motors, was concerned about a price gap that existed between Buick and Cadillac. The LaSalle was introduced in 1927 to fill this gap. Though built by Cadillac to Cadillac standards, the LaSalle from the very beginning was its own car and ever a pace-setter for Cadillac. Designed by GM’s Chief Stylist, Harvey Earl, to be “No quite as conservative as the Cadillac.” The LaSalle’s design was obviously inspired by one of the most sensational looking cars on the European continent, the Hispano-Suiza. A quality car and a recognized car leader for the thirteen years it was produced, LaSalle struggled throughout the depression of the 1930’s and was finally discontinued in 1940. 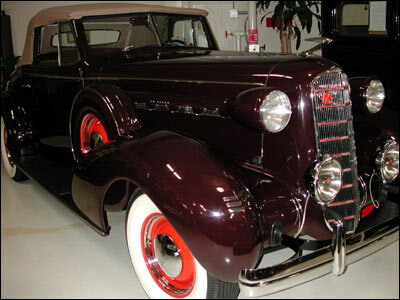 In 1941, what would have been the LaSalle became the new Series 61 Cadillac. This beautifully restored 1936 LaSalle convertible is on loan from the Mickey and Barbara Miller collection, Elizabethtown, Kentucky.